John Flucke's Blog - Ramblings of Dentistry's Technology Evangelist: Panasonic's new medical Tablet PC? Panasonic's new medical Tablet PC? 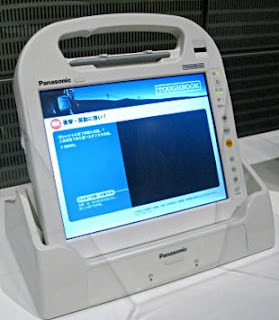 This leaked photo is reportedly of a new medical Tablet PC coming in the not too distant future from Panasonic. I love Tablets and this one has a special secret. Rumor has it that it is running on the new Intel Atom processor. What does that mean, you ask? The Atom does not need any ventilation, and that, my friends, means the device can be made waterproof. Imagine being able to completely disinfect or wipe down the unit with no risk of damaging sensitive internal parts. No word yet on cost or availability. JVC pulls the plug on the VCR - literally! Needle-less Injections on the Horizon? Amazon Kindle 2.0 really does exist!